Students at NUSD take English classes in the first, second and third grades. The following is a brief introduction to classes and topics. In the first grade, the focus is on general English with particular emphasis on listening and speaking skills and students are expected to give oral presentations on topics of their own choice. In addition, students will practice one-minute speeches in English without notes. In the second grade, we use as a base the following text: English for the Dental Clinic, which is published by Ishiyaku Shuppan. Students will expand their dental vocabulary, which is introduced in both written and oral form. Essential dental clinic dialogues are introduced and emphasis is placed on being able to reproduce the dialogues in the textbook. In the second semester, students study Dental Topics in the news and give short oral presentations in English. Students also practice writing short passages on dental topics. 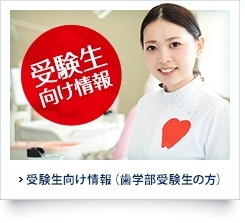 In the third grade, the title of the program is Medical and Dental English. We study several case studies from English journals. Students will have a lecture on the background of the study by a dentist who specializes in the field. This lecture is in Japanese, but important English vocabulary and dental terminology is introduced from the case study. In the following lecture, which is on the same day, students use worksheets and read the case study. Online quizzes are done and students get individual instruction from teachers of English. Assessment depends on an oral or poster presentation done in English and an examination that focuses on vocabulary and reading comprehension. In addition, there is an optional English class that is available to students in grades 3, 4 and 5. The focus is on general health and dental topics, which will be studied in small groups with the emphasis on oral skills and discussion. Copyright© NIHON UNIVERSITY SCHOOL OF DENTISTRY, All rights reserved.